Have you ever gazed longingly up at a Monet and felt as if you could just drift off to sleep? That kind of behavior might get you kicked out of London’s National Gallery, but this won’t: the Gallery just launched a partnership with Savoir Beds that lets you do just that, undisturbed. 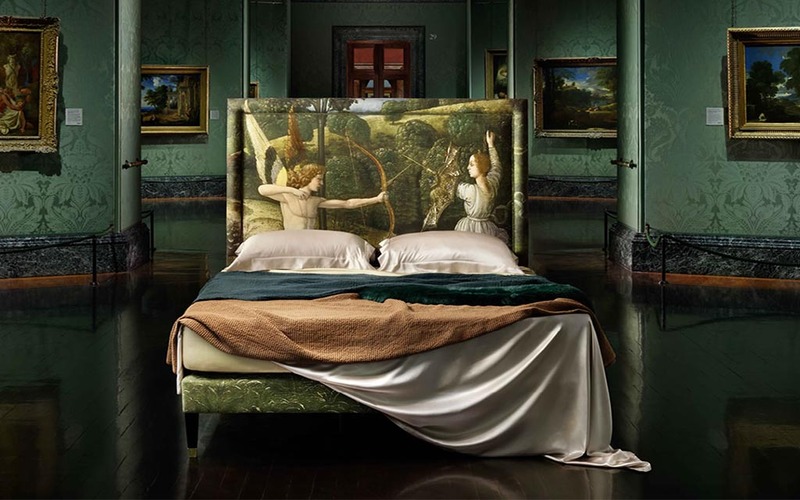 The luxury bedding company — known for their $50,000 handmade beds created with cashmere and curled horsetail — is now commissioning frames inspired by any of the National Gallery’s 2,300 paintings. Once a customer has choosen a painting, Savoir Beds works with design firm Andrew Martin to print the design on velvet, linen viscose or cotton, then adds a bespoke plaque denoting the painting and artist. The National Gallery also signs off on every commission to ensure the art’s integrity remains intact. While a calming Monet or Van Gough seems like the obvious choice, given a cool $35,000, I think I’d go with “Bacchus and Ariadne” by Titian or “The Toilet of Venus” by Diego Velázquez. The latter is much sexier than the name implies. But knowing that someone can drop $35k for a bed with Quinten Massys’s “An Old Woman” is oddly pleasing — if slightly disturbing — too.